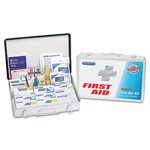 First aid kit is designed for use by up to 50 people and exceeds OSHA requirements ANSI Z308.1.2009 compliant. Organized, compact container makes finding items quick and convenient. Use this wide variety of first aid items to treat most incidents and accidents. Kit includes antiseptic towelettes, alcohol pads, sting relief wipes, cold pack, eye pad, medical-grade latex gloves, absorbent pad, antibiotic and burn ointments, assorted adhesive bandages and gauze pads, finger splints, tape, triangular bandage, scissors, tweezers and first aid guide.